Canada now has access to iGroom products at Lynn Professional! iGroom is a leading luxury pet beauty and health company with a reputation for the finest scientifically-developed shampoos, conditioners, skin cares and other products available for pets. iGroom was created by pet lovers for pet lovers, by professionals for professionals, including Jennifer Lee, world-renowned pet stylist and grooming expert, who collaborated with a team of skilled experts to add professional experiences and advanced chemistry to grooming products. 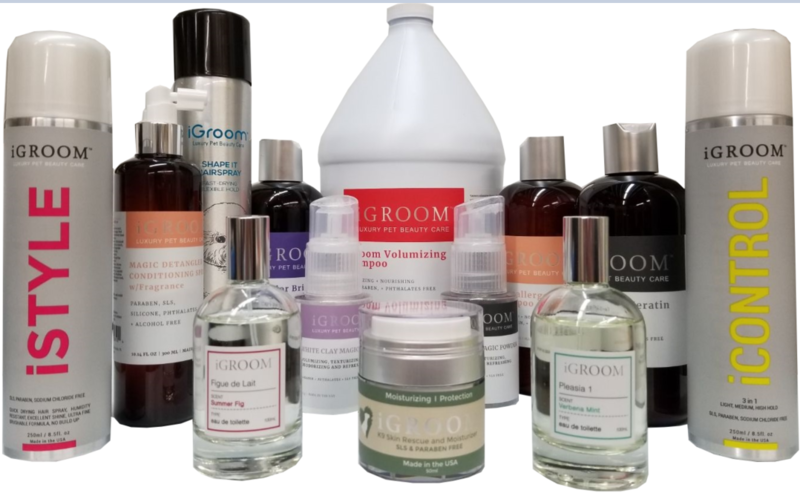 iGroom has paraben, sulfate, silicone, phthalate, animal ingredient FREE shampoos and conditioners, aerosol sprays, detanglers, magic powder sprays, skin rescues, and perfumes. All products are made in the USA. iGroom has a fantastic dematting product called, Magic Detangler Conditioning Spray (NO silicon, parabens, SLS, alcohol or phthalates), it is a leave-on protein sealer and treatment that represents a new breakthrough in conditioning, only from iGroom. The unique scientific formula balances your pet’s hair elasticity by providing essential nutrients, including hydrolyzed keratin & vegetable proteins to add excellent conditioning and moisture to the hair. Click here to watch our video on how easily this product removes matts from armpits!